The secret to a delicious creamy soup is the combination of lowest possible heat and continuous stirring for smooth consistency. 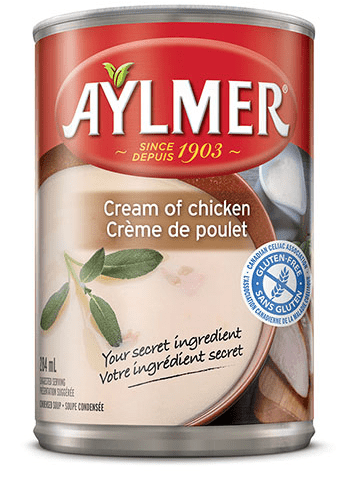 With the flavour and texture variation of chicken pieces, Aylmer’s Gluten Free Cream of Chicken is seasoned to perfection for soothing satisfaction every time you need the comfort of a warm, creamy soup. It is also the perfect comforting down-home base for casseroles and sauces. In a large pan heat the oil on medium-high heat. Add the chicken and cook for 5 minutes or until the chicken has completely browned. Add the rice, Cream of Chicken Soup, asparagus, water and wine and bring to a boil. Cover and reduce the heat to medium-low. Allow to simmer for 5 minutes. Take pan off the stove. Add the bacon, cheese and thyme. Allow to sit covered for 5 minutes. Place the first pie shell in a 9-inch pie plate. In a large saucepan, tenderize the onions, carrots and celery in oil for 5 minutes. Add the Cream of Chicken Soup, potatoes and milk and bring to a boil. Add the chicken and adjust the seasoning. Pour the mix into the pie plate and cover with the other pie shell. Make an incision on top to allow the steam to escape. Cook in the oven at 375ºF for 30 to 35 minutes. Let stand for a bit while before serving. 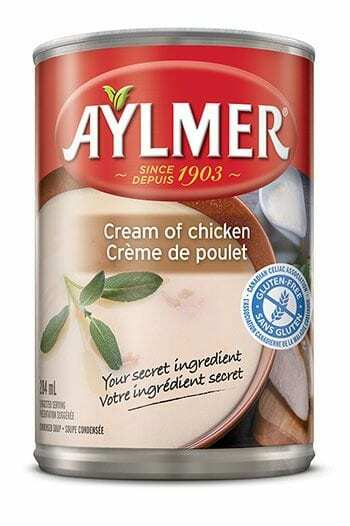 © 2018 BCI Foods Inc. The trade-mark Primo is a registered trade-mark of Primo Foods Inc. and BCI Foods Inc. is a licensed user of the mark.